In French, "avoir les jetons" means literally, "to have tokens" and translates to "to have the willies, to have the heebeejeebees," or "to be scared," etc. 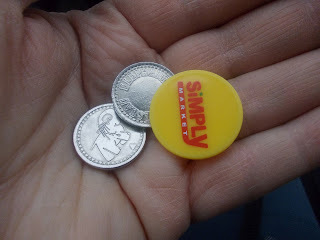 The yellow one is for a grocery store cart (you can't detach them without one or without a money coin) and the elephant ones are for a car wash. Irritation: I bought a bunch from this chain, only to learn that they don't work in all of their affiliates. Grrrr.